Bollywood industry is known for its dance, music, dazzling clothes, over the top melodrama and evergreen dialogues. Over the years Bollywood has produced some iconic dialogues that have knowingly or unknowingly become of part of our daily life. There is a dialogue available for every mood and setting. Every Indian across the world has grown up mouthing some of the best and popular dialogues in their life once. While a lot of them are dialogues, there are a few monologues that are inspiring, heart breaking and some that give us goosebumps. Some of the monologues have so much depth that they stay with us for a long time even after we have left the theatre. 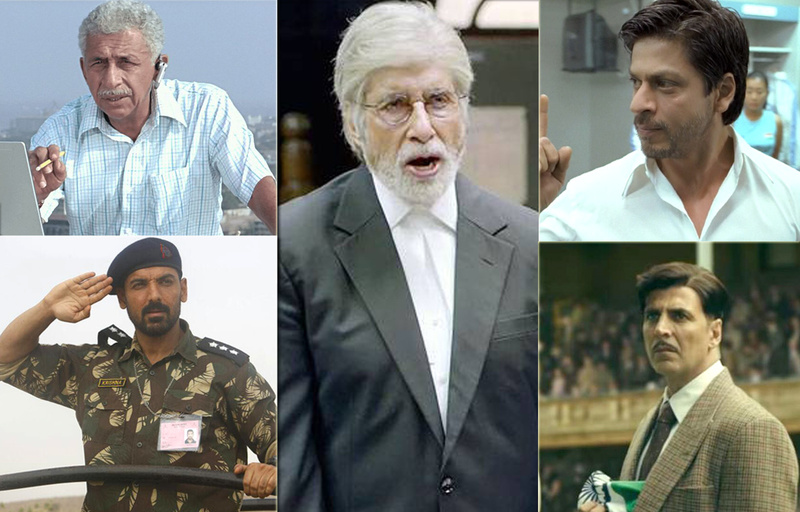 Here are some of the most powerful monologues mouthed by some of the best actors of Indian cinema that will always be remembered. One of the best films of Shahrukh Khan, Chak De has some of the finest dialogues to look for. The ‘Sattar Minute’ monologue by SRK just before the last match between the Indian and Australian hockey team is considered to be one of the best monologues ever produced. The monologue is so powerful and intense that it gives one goose bumps. It is a source of inspiration that can be used in anyone’s life not just for a game but any situation where one is afraid and need a morale boost. The actor of the millennium Amitabh Bachchan has delivered innumerable dialogues and monologues over the years. He has been a great source of inspiration to many aspiring actors on dialogue delivery and acting with passion. His monologue from the film Pink ‘No Means No’ is one such monologue that is considered to be a landmark statement and that talks about consent in the most honest way possible. His voice not only graced the monologue but brought life into it. Actress Taapsee Pannu with her each of her films is raising the bar for herself and giving her fans a lot more to look forward to. From her first film Chasme Badduur to her latest Mulk, Taapsee has set a benchmark in Bollywood. She plays a lawyer in the film and delivers a powerful and impacting performance alongside Rishi Kapoor. Adding to the list of powerful monologues Taapsee finds her place with the monologue ‘Hum Aur Woh’ in Mulk. This is the dialogue about prejudice and she talks about how the world is diving people based on their religions instead of uniting them based on their humanity. She delivers the heartwrenching monologue while arguing with Ashutosh Rana in the court. Mulk has been receiving praise from all over and rightfully so but the Taapsee Pannu dialogue has been causing people to give standing ovations in cinemas across the country. The young bubbly actress Alia Bhatt has been winning millions of hearts from her first film. She impressed audience even in her de-glam look in Highway. Her latest film Raazi is one the best films of her career. The monologue in the last scene of Raazi where she cries in despair and begs to be sent back home is heart wrenching and powerful. Its forces the audience to feel pity and brings them to tears along with Alia. Kudos to Alia for creating an impactful monologue at such early stage in her career. One of Indian cinema’s finest actors Naseeruddin Shah has given us many memorable performances and dialogues to remember. He is an institution in himself and an inspiration to many budding actors. His monologue ‘I am just a stupid common man’ from the film A Wednesday is one of the best monologues from the list. It so hard hitting and powerful that it literally makes one think twice about taking everything lying down as a common man. He may be not one of the Kapoors, Khans or the Bachchans but he is one of the biggest superstars in Bollywood. From Namastey London to Padman Mr Khiladi gave memorable monologues in every film. He added another feather in his cap with his solid performance in the movie Gold and his monologue “Hum Gold Jeetega” before the climax scene where he tries to reunite the team and tells his dream of winning Gold in hockey as a free Indian. His enthusiasm and energy flood every nerve with the blood of patriotism.